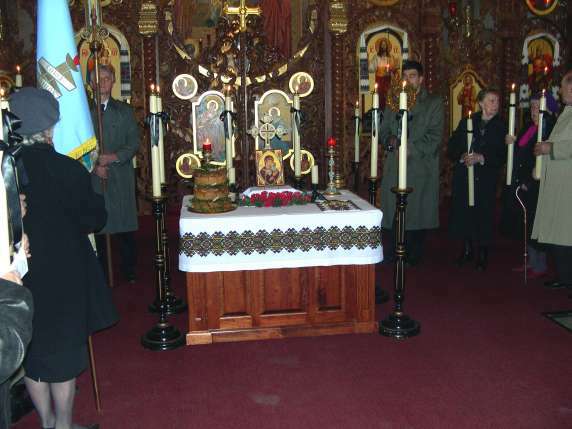 On Sunday, November 25th, 2010, the St. George parish community commemorated the Holodomor, the famine-genocide in Eastern Ukraine orchestrated by Stalin during the years 1932-33. The morning Divine Liturgy was followed by a Panachyda, at which the pastor and members of our nearby St. John Ukrainian Orthodox Church joined with our clergy and congregation in praying for the victims of this horrible event. After the services, a "hunger" banquet took place at Lviv Hall. Everyone was served a meagre slice of the memorial kolach and a cup of thin borshcht. This was followed by a solemn memorial programme, organized by the local branch of the Ukrainian Canadian Congress. Symbols of the Holodomor: memorial candles tied with black ribbons, an empty bowl, an empty grain sack. The candles had received their first lighting from a special Holodomor candle from Ukraine. 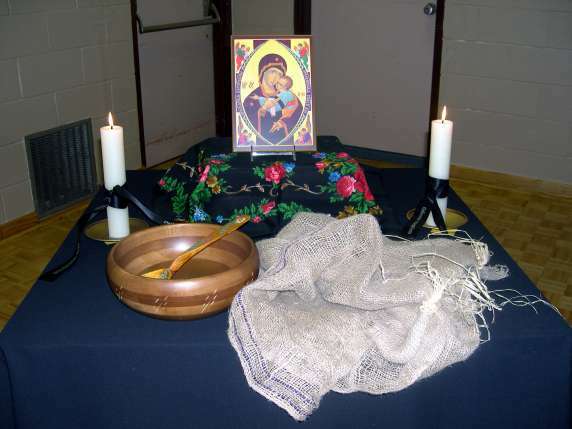 The icon of the Most Holy, Most Sorrowful Mother in the background was written by iconographer Bohdan Holowacki especially for the 75th anniversary of the Holodomor in 2007.